Recently I visited the excellent website of HunoPPC, who is one of the most active porters of games to AmigaOS 4. 1941 Extreme Deluxe, Zelda Mystery of Solarus XD, Hurrican and Abuse are all examples of titles he’s brought to the OS. I will definitely try many of the games here on this blog. Today I’m giving one of his older ports a go. It’s called Breakers, but it’s really Arkanoid. This version was put together by Clément Corde and ported to AmigaOS 4 back in 2012 by HunoPPC. If you try searching for the term “Arkanoid” in a search-engine, you’ll most probably end up with millions of hits. A quick Google-search brought forth nearly 9 million. It’s safe to say that it was a popular game back in the days and it still is amongst some people. It was originally developed by Taito in 1986. According to Wikipedia, it expanded upon Atari’s Breakout games of the 70’s by adding power-ups, different types of brick, variety of level layouts and more. The game proved a success and was ported to a wide range of platforms, including the Amiga. 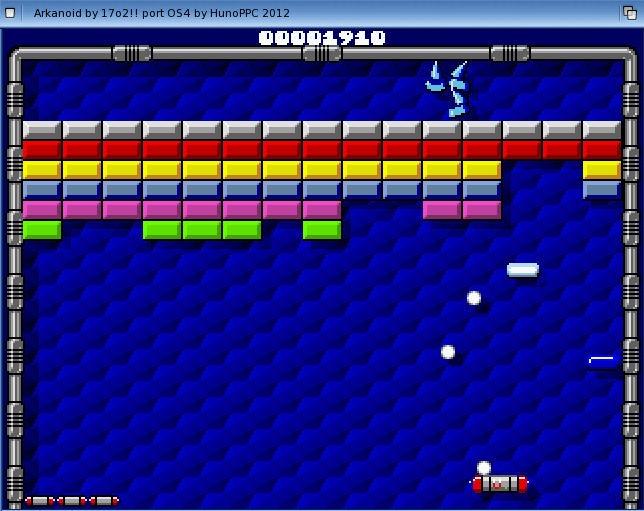 It was not before 2012, however, that Arkanoid would enter the world of AmigaOS 4. If you want to download the game to try it, please click on the link below. Downloading should start at once. When the archive has finished downloading, extract it to your wanted directory (right-click on the icon, then choose “extract to”). After that it’s just a matter of double-clicking the icon to start playing! I guess almost everyone has played a bat’n’ball game like Arkanoid some time in their life. It’s pretty straight forward. The ball bounces around the screen and you’ll have to hinder it from reaching the bottom of the screen. The aim is to clear all levels of bricks. There are many bricks waiting to be crushed! This port by HunoPPC is fast and fluid and is displayed in a window on your Workbench screen. You control the bat with the mouse. Controls are responsive. It’s been quite a while since I last played Arkanoid, but this port seems to be just like it. It has the levels, the power-ups, the graphics, you name it. Don’t be fooled, this level is harder than you think. So what more is it to say about this game? Thanks for reading and hope to see you in another post on this blog.